I must say that I was a bit cynical about this show as I arrived. Is it unfair that I’m a bit sceptical of the word ‘development’ nowadays? I know how much Liverpool has benefitted from regeneration, but there are still mixed connotations around the concept. Last month when The Guardian published this article about busted building projects, over half of the list was sites in our city. Too many creative hubs and artistic venues – the very creative enterprises which make Liverpool such an interesting place to live – have been pushed out to make way for big developers, who are their own worst enemies when it comes to their reputation for prioritising quick profits over building for meaningful social benefit. It’s why I wanted to look at this show: because architecture is arguably the art which has the biggest impact on how we actually live. Developers have a massive influence not only on what our built environment looks like, but what we do there (as when they police what activities are locally available). And the companies responsible should, in an ideal world at least, have some consideration for how people actually want to live their lives. This, according to It Will Never Work, is where Urban Splash come in. 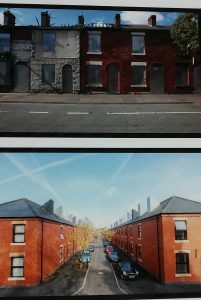 This exhibition is a retrospective of 25 years of property development firm Urban Splash. A company which started out in Liverpool by transforming Concert Square, they’ve since become involved with major projects across the country. I’ve called it a ‘retrospective’ but it really feels like a straight-up celebration, giving us multiple success stories and being told predominantly in the words of company directors Tom Bloxham and Jonathan Falkingham. This doesn’t do much to ease my cynicism: allowing vested interests to tell a story is always going to come with suspicions that we’re being told the story through rose-tinted specs. Getting you to see the best in an artist might be what all gallery shows do – but an art show in a public gallery doesn’t have as much commercial incentive as Urban Splash, still very much involved in the game, do. Knowing this, RIBA help to set out the stall that Urban Splash really are a company who do things differently. The most obvious ‘artistic’ features in the room are the huge illuminated panels of myths they defy: ‘GOLD-DIGGER’ ‘JUNKIES’ ‘SCHEMERS’. The narrative is not just about business success but of how the company has realised idealistic ambitions of how to transform our urban experiences. And as I browse the myriad photographs of before-and-after sites, it seems that they really have done good. The before-and-after photos of Concert Square are particularly surprising to anybody who, like me, has never known the space as anything other than a nightlife hub. 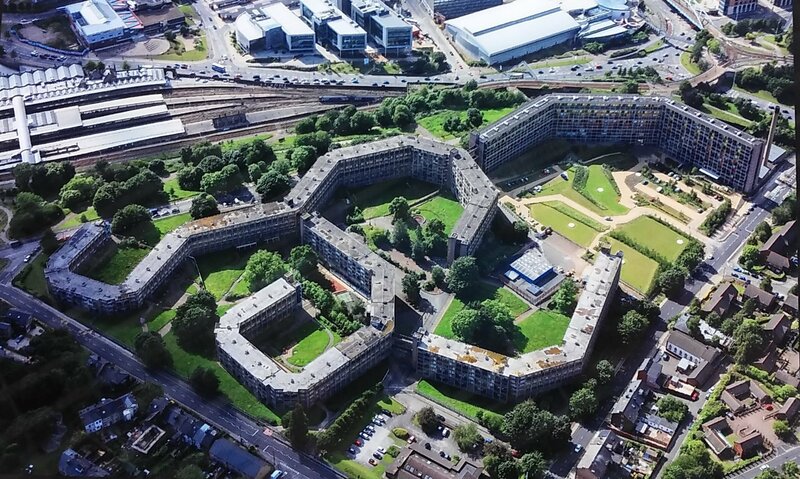 Then there’s the work they’re still involved with on Sheffield’s Park Hill estate. I’ve got a soft spot for Brutalist architecture, but it does have that association with neglect and deprivation. It must take guts to commit to turning a long-standing site of ridicule into something desirable. Furthermore, the praises of Urban Splash have been sung by artists of late – the development of Salford’s new Paradise Works studio was in part supported by the company. These sites reflect Urban Splash’s most popular modus operandi: take an other abandoned building and turn it to a new, modern purpose. Which is surely better than razing everything to the ground, or even worse living amongst the ruins of what once was. If there’s a negative to where this leads – increasing prices, gentrification, locals being pushed out – is that Urban Splash’s fault? Or does the company only represent one part of what should be a much larger jigsaw for responsible development, one on which it is easy for other parties to foist more responsibility than they necessarily deserve? Huge questions – and not the ones this exhibition is here to answer. It Will Never Work is in some ways an economic fairytale: the story of two men who saw a gap in the market and filled it, making everyone happier in the process. Consequently, I’m not entirely sure what to make of it. Urban Splash are portrayed as the heroes of high-quality housing – a highly admirable ambition, but one which a quick Google shows is perhaps not always the experience of residents. On the other hand, the improvements to some of the buildings and areas they work with are impressive. Urban Splash started with a vision of what modern life should look like, and made it work with success. Whatever your feelings about the commercial aspect of what they do, there’s still space to be impressed by their ability to see the possibilities in what the old model world has left behind. This entry was posted in Current exhibitions, Exhibitions, Home and tagged architecture, art, Liverpool, urban living. Bookmark the permalink.